Looking for the critical moments for diagnostic intervention, we note two mandatory physician interactions before the child's detachment. The first is the intake for prenatal care. At that visit, there are three parental diagnostic states as follows: one, the parents know the positive SS status; two, the parents are unaware of their positive SS status, perhaps because they have mild disease; and three, parents with a negative SS status. The typical prenatal questionnaires posted online show no direct attention to this disease. [Table 1] lists some proposed strategic questions to add to the prenatal intake. The second group of parents may not know their diagnosis, and the diagnosis may be discovered with attention to a more detailed history elicited by the other questions in [Table 1]. One feature of SS, that is very common and easy for nonphysicians to identify, is early-onset high myopia (EOHM) which is present in both combined and ocular predominant phenotypes., This is probably the most strategic (sensitive) first question. Following up with questions about other features (e.g., family history of RD, early-onset cataract, early-onset arthritis, cleft, hearing loss, and Pierre Robin sequence [PRS]) increases the likelihood for the diagnosis of SS. In either case, a patient with EOHM could be referred to an ophthalmologist trained in the details of the eye examination for SS [Table 2]. 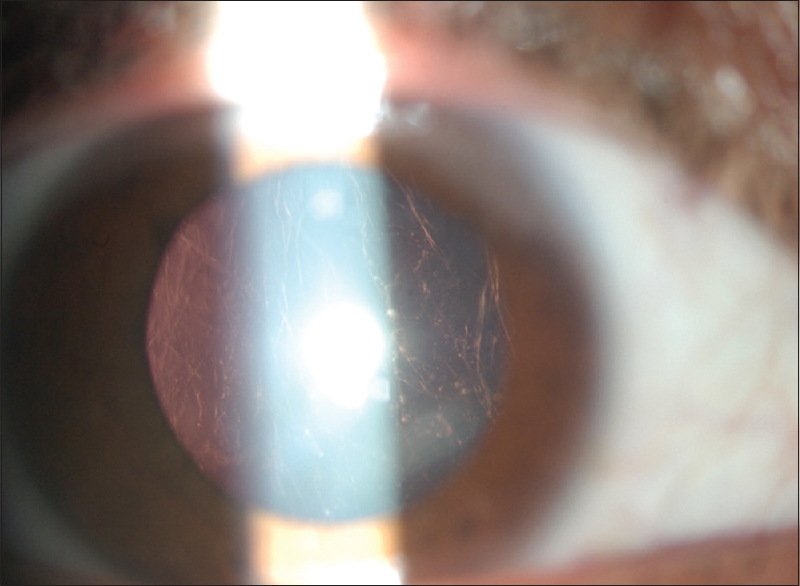 The most helpful finding is vitreous anomaly with membranous, beaded, optically empty, or fibrillar vitreous [Figure 1] and [Figure 2]. Patients with the combination of EOHM and vitreous anomaly or another feature are strong suspects for SS. In addition, very helpful is identification of a normal vitreous. 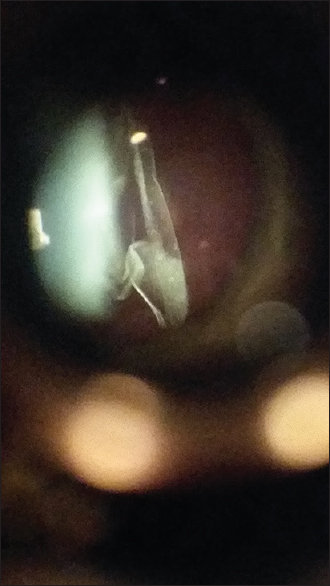 Well-formed vitreous is conceptually incompatible with a collagen defect as seen with SS type 1 and 2. Moreover, we have never observed a well-formed vitreous in SS. However, there are occasional eyes with indeterminate abnormal vitreous. If the vitreous is anomalous and the diagnosis is confirmed the parents must be educated, and the family referred for genetic counseling. The obstetrician must also prepare for a complex airway deliver while awaiting a genetic consultation or molecular testing. The geneticist will also identify subtle nonocular findings of SS [Table 3]. For the ocular predominant phenotype, the Stickler focused diagnostic eye examination is the only clinical method for diagnosis [Table 2]. The examination emphasizes four characteristic ocular findings: early-onset myopia, vitreous anomaly, perivascular pigmentation or lattice [Figure 3], and wedge-shaped cataract. EOHM is observed commonly in SS. However, some pedigrees do not show myopia at any age, and others have a mix of low and high myopia. There is no overall dataset to provide a statistic at this time. In any case, the early onset of myopia less than the age of 5 years, even if <6 diopters may a helpful clinical feature. Myopia even High myopia, is a very common condition and therefore less specific than the 3 other features. These findings make the diagnosis quite likely, but their absence does not rule out the condition. Vitreous anomaly has been documented by slit lamp., The vitreous anomaly may also be detected by ultra-wide field retinal imaging (Optos P200Tx, Optos, Scotland, UK) and optical coherence tomography (OCT) especially swept source. However, the predictive value of the new findings has not been systematically determined. The anomaly may change with age and growth of the eye. It may also be undetectable or indeterminate in young children. Once a patient is diagnosed with SS, we recommend a program of monitoring to detect a retinal detachment within 3 months. This is likely to allow an efficient repair of GRTs before the development of severe PVR. We consider this guideline a work in progress that will change as more data is collected [Table 4]. Since we have diagnosed a patient at 8 months with a GRT, we suggest a first examination at 6 months. We would follow-up with examinations every 3–4 months. Under age 1 year, the examination would be with a papoose constraint and using Indirect Ophthalmoscope, depressor and speculum. At ages 1–3, there would be no constraint but Indirect Ophthalmoscope at lowest setting and additional study with B-scan ultrasound on each examination. 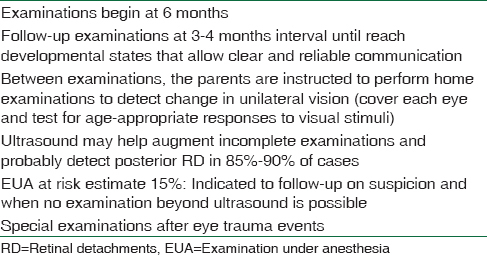 We recommend EUA annually until the child allows a examination of the posterior and equatorial retina. In cases of previous laser prophylaxis, the examination must extend until into the zone of laser-induced chorioretinal atrophy can be seen. EUA is recommended for suspicion of break or retinal detachment or significant trauma. At 3 years or when the child is able to communicate and follow instruction, attempt to train the child with frequent examinations that are rewarded. Continue until around 7 years old or when the child can fully cooperate with the parents and demonstrate clear communication skills. Every month at home we ask the parents to test each eye for normal vision by covering each eye and eliciting responses to age-appropriate visual stimuli. Stickler GB, Belau PG, Farrell FJ, Jones JD, Pugh DG, Steinberg AG, et al. Hereditary progressive arthro-ophthalmopathy. Mayo Clin Proc 1965;40:433-55. Robin NH, Moran RT, Ala-Kokko L. Stickler syndrome 2000 Jun 9. In: Adam MP, Ardinger HH, Pagon RA, Wallace SE, Bean LJ, Stephens K, Amemiya A, editors. GeneReviews®. Seattle (WA): University of Washington, Seattle; 1993-2018. Available from: http://www.ncbi.nlm.nih.gov/books/NBK1302/PubMedPMID: 20301479. [Last updated on 2017 Mar 16]. Snead MP, Yates JR. Clinical and molecular genetics of Stickler syndrome. J Med Genet 1999;36:353-9. Richards AJ, Baguley DM, Yates JR, Lane C, Nicol M, Harper PS, et al. Variation in the vitreous phenotype of Stickler syndrome can be caused by different amino acid substitutions in the X position of the type II collagen gly-X-Y triple helix. Am J Hum Genet 2000;67:1083-94. Richards AJ, Martin S, Yates JR, Scott JD, Baguley DM, Pope FM, et al. COL2A1 exon 2 mutations: Relevance to the Stickler and Wagner syndromes. Br J Ophthalmol 2000;84:364-71. Kanski JJ. Giant retinal tears. Am J Ophthalmol 1975;79:846-52. Schepens CL, Freeman HM. Current management of giant retinal breaks. Trans Am Acad Ophthalmol Otolaryngol 1967;71:474-87. Freeman HM, Castillejos ME. Current management of giant retinal breaks: Results with vitrectomy and total air fluid exchange in 95 cases. Trans Am Ophthalmol Soc 1981;79:89-102. Chang S, Lincoff H, Zimmerman NJ, Fuchs W. Giant retinal tears. Surgical techniques and results using perfluorocarbon liquids. Arch Ophthalmol 1989;107:761-6. Scott IU, Murray TG, Flynn HW Jr., Feuer WJ, Schiffman JC, Perfluoron Study Group, et al. Outcomes and complications associated with giant retinal tear management using perfluoro-n-octane. Ophthalmology 2002;109:1828-33. Berrocal MH, Chenworth ML, Acaba LA. Management of giant retinal tear detachments. J Ophthalmic Vis Res 2017;12:93-7. Federman JL, Shakin JL, Lanning RC. The microsurgical management of giant retinal tears with trans-scleral retinal sutures. Ophthalmology 1982;89:832-9. Peyman GA, Rednam KR, Seetner AA. Retinal microincarceration with penetrating diathermy in the management of giant retinal tears. Arch Ophthalmol 1984;102:562-5. Ando F, Kondo J. Surgical techniques for giant retinal tears with retinal tacks. Ophthalmic Surg 1986;17:408-11. Kertes PJ, Wafapoor H, Peyman GA, Calixto N Jr., Thompson H. The management of giant retinal tears using perfluoroperhydrophenanthrene. A multicenter case series. Vitreon collaborative study group. Ophthalmology 1997;104:1159-65. Scott IU, Flynn HW Jr., Azen SP, Lai MY, Schwartz S, Trese MT, et al. Silicone oil in the repair of pediatric complex retinal detachments: A prospective, observational, multicenter study. Ophthalmology 1999;106:1399-407. Abeysiri P, Bunce C, da Cruz L. Outcomes of surgery for retinal detachment in patients with Stickler syndrome: A comparison of two sequential 20-year cohorts. Graefes Arch Clin Exp Ophthalmol 2007;245:1633-8. Reddy DN, Yonekawa Y, Thomas BJ, Nudleman ED, Williams GA. Long-term surgical outcomes of retinal detachment in patients with Stickler syndrome. Clin Ophthalmol 2016;10:1531-4. You C, Wu X, Zhang Y, Dai Y, Huang Y, Xie L, et al. Visual impairment and delay in presentation for surgery in Chinese pediatric patients with cataract. Ophthalmology 2011;118:17-23. Kaiser Permanente Prenatal Intake Questionnaire. Available from: https://mydoctor.kaiserpermanente.org/ncal/Images/03925-013%20(12-13)_ADA(2)_tcm75-827347.PDF. [Last accessed on 2018 Oct 23]. Lauritsen KF, Lildballe DL, Coucke PJ, Monrad R, Larsen DA, Gregersen PA, et al. Amild form of Stickler syndrome type II caused by mosaicism of COL11A1. Eur J Med Genet 2017;60:275-8. Snead MP, McNinch AM, Poulson AV, Bearcroft P, Silverman B, Gomersall P, et al. 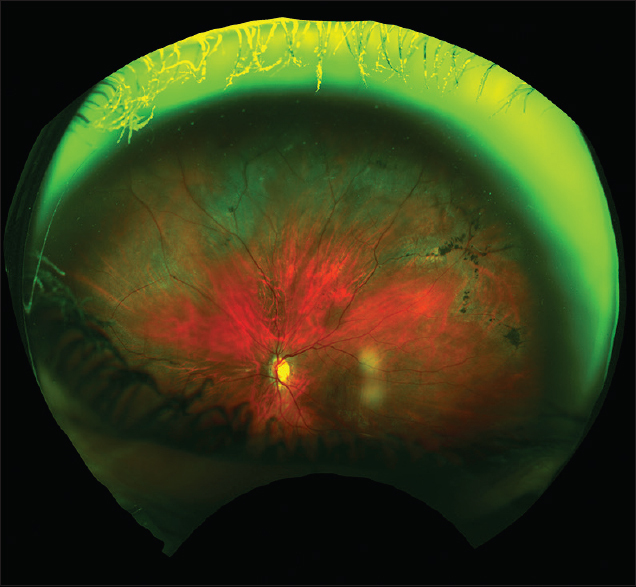 Stickler syndrome, ocular-only variants and a key diagnostic role for the ophthalmologist. Eye (Lond) 2011;25:1389-400. Parma ES, Körkkö J, Hagler WS, Ala-Kokko L. Radial perivascular retinal degeneration: A key to the clinical diagnosis of an ocular variant of Stickler syndrome with minimal or no systemic manifestations. Am J Ophthalmol 2002;134:728-34. Silva RA, Blumenkranz MS. Prophylaxis for Retina Detachment; AAO Clinical Education. Available from: https://www.aao.org/munnerlyn-laser-surgery-center/prophylaxis-retinal-detachments. [Last accessed on 2018 Oct 23]. Ang A, Poulson AV, Goodburn SF, Richards AJ, Scott JD, Snead MP, et al. Retinal detachment and prophylaxis in type 1 Stickler syndrome. Ophthalmology 2008;115:164-8. Fincham GS, Pasea L, Carroll C, McNinch AM, Poulson AV, Richards AJ, et al. Prevention of retinal detachment in Stickler syndrome: The Cambridge prophylactic cryotherapy protocol. Ophthalmology 2014;121:1588-97. Alshahrani ST, Ghazi NG, Al-Rashaed S. Rhegmatogenous retinal detachments associated to Stickler syndrome in a tertiary eye care center in Saudi Arabia. Clin Ophthalmol 2016;10:1-6. Monin C, Van Effenterre G, Andre-Sereys P, Haut J. Prevention of retinal detachment in Wagner-Stickler disease. Comparative study of different methods. Apropos of 22 cases. J Fr Ophtalmol 1994;17:167-74. Zauberman H. Tensile strength of chorioretinal lesions produced by photocoagulation, diathermy, and cryopexy. Br J Ophthalmol 1969;53:749-52. Marmor MF. Mechanisms of retinal adhesion. Prog Retinal Res 1993;12:179-204. Kita M, Negi A, Kawano S, Honda Y, Maegawa S. Measurement of retinal adhesive force in the in vivo rabbit eye. Invest Ophthalmol Vis Sci 1990;31:624-8. Freeman HM. Fellow eyes of giant retinal breaks. Trans Am Ophthalmol Soc 1978;76:343-82.